Sister Mary Joan Unsinn, I.H.M. Sister Mary Joan, I.H.M., formerly Theresa M. Unsinn, died in Camilla Hall Oct. 26 in the 79th year of her religious life. She was 96 years old. Born in Mahanoy City, Pa., Sister Mary Joan entered the Congregation of the Sisters, Servants of the Immaculate Heart of Mary in 1933 from St. Fidelis Parish in Mahanoy City, and professed her first vows in 1936. She received her Bachelor of Arts degree from Immaculata University and a Master of Arts from the Catholic University of America. Sister Mary Joan taught or was an administrator in the elementary and secondary schools in the Archdiocese of Philadelphia and the Dioceses of Allentown, Harrisburg and Arlington. She served in Lima, Peru for eight years. She was the Dean of Activities at Cardinal O’Hara High School for eight years and at St. Maria Goretti High School for six years. In 1971 she was appointed vice principal at Bishop McDevitt High School in Wyncote. She was among the first women religious to serve in this capacity. Sister Mary Joan returned to Cardinal O’Hara in 1985 where she taught Spanish for several years before serving in the finance office. 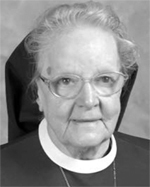 In 2007 she was assigned to Camilla Hall where until her death, her ministry was the apostolate of prayer. The funeral Mass was celebrated at Camilla Hall Nov. 2. Msgr. Philip J. Cribben was the celebrant and homilist. Msgr. Richard J. Skelly was a concelebrant. Interment followed in the Immaculata Cemetery. In addition to the members of her religious community, Sister Mary Joan is survived by many nieces, nephews, grandnieces and grandnephews. She was predeceased by her parents, John K. and Christine Cahill Unsinn, siblings Sister Regina Therese, I.H.M., Josephine Tomalonis and Virginia Rudolph. NEXT: Sister Marita Anne McGonigle, I.H.M. Sister Mary Joan was/is the most amazing human being I had the honor to meet. She was my Spanish teach but I learned more about faith and compassion than any other place. Nobody had a greater spiritual impact on my life than Sister.